The Pittsburgh Penguins travel to Bell Centre to play the Montreal Canadiens on Tuesday, October 18, 2016. The opening line for this game has the Penguins at +150 and the Canadiens at +150. The over/under has been set at 5.5. Pittsburgh comes into this matchup after having a regular season record of 48-26-8 last season and on the road they had a record of 22-15-4. They finished 2nd in the Metropolitan Division. They scored 245 goals and gave up 203 goals for a point differential of +42. The Penguins had 8 overtime losses including 4 of them in a shootout. In their last 10 games they had an overall record of 8-2-0. For the season they had an ATS record of 45-33 and an over/under record of 36-32-14. Montreal had a regular season record of 38-38-6 including 22-16-3 at home last season. They were 6th in the Atlantic Division. They scored 221 goals and surrendered 236 for a goal differential of -15. The Canadiens had 6 losses in OT and 3 of them occurred in a shootout. They had a record of 5-5-0 in their last 10 contests. Their record against the spread was 35-44 while their over/under record sat at 40-30-12. Evgeni Malkin accumulated 58 total points last season for the Penguins. He had 27 goals last year with 162 shots on goal giving him a shooting percentage of 17%. He had a total of 31 assists on the season and averaged 19 minutes played per game. Kris Letang averaged 27 minutes of ice time per game last year. In that time he had a shooting percentage of 7% by scoring 16 goals on 218 shots. He had 51 assists giving him a total of 67 points on the season. Marc-Andre Fleury had 35 wins and 17 losses last season in net for the Penguins. He had 1,665 shots against him and gave up 132 goals. He made 1,533 saves for a save percentage of 92%. Tomas Plekanec accumulated 54 total points last season for the Canadiens. He had 14 goals last year with 189 shots on goal giving him a shooting percentage of 7%. He had a total of 40 assists on the season and averaged 19 minutes played per game. 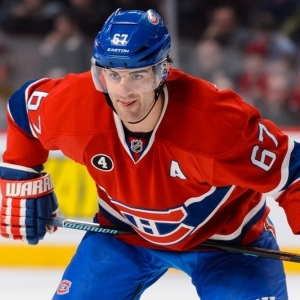 Max Pacioretty averaged 19 minutes of ice time per game. In that time he had a shooting percentage of 10% by scoring 30 goals on 303 shots. He had 34 assists giving him a total of 64 points on the season. Al Montoya had 12 wins and 7 losses this season in net for the Canadiens. He had 608 shots against him and gave up 49 goals. He made 559 saves for a save percentage of 92%. The Penguins had 104 total points last season. They scored 245 goals while giving up 203 goals. They had 261 power play opportunities and scored 48 goals on those chances for a percentage of 18%. The Penguins allowed 257 power play opportunities and gave up 40 goals on those chances for a penalty kill percentage of 84%. They averaged 33 shots per game and as a team they shot 9.00% for the season. They allowed 30 shots to their opposition per contest and had a team save percentage of 92%. The Canadiens had a total of 82 points on the season. They had 42 power play goals on 259 opportunities for a percentage of 16%. They allowed 254 power play opportunities and gave up 46 goals on those chances for a penalty kill percentage of 82%. As a team, the Penguins had a total of 221 goals scored while they gave up 236 goals during the campaign. They averaged 31 shots per contest and had a team shooting percentage of 8.83%. As a team they gave up 29 shots per game and had a save percentage of 91%. Pittsburgh had a Corsi percentage of 52.3% as they attempted 4,812 shots on net at full strength while they gave up 4,384 shots on net in the same situations. Their Fenwick percentage was at 52.5% as they had 3,638 attempts while they gave up 3,293 shots on the defensive end. The Penguins started possessions in the offensive zone 52.3% of the time while their defensive zone percentage was at 47.7% for the season. They had 2,593 face off wins compared to 2,576 losses, meaning their faceoff win percentage was 50.2%. On defense Pittsburgh had 1,947 hits and they blocked 1,091 shots from the opposition. Montreal attempted 4,708 shots at full strength and they gave up 4,447 attempts, meaning their Corsi percentage was at 51.4% for the season. In terms of Fenwick percentage, they were at 51% as they had 3,431 shots while they gave up 3,303 attempts on defense. The Canadiens had an offensive zone percentage of 49.6% and their defensive zone percentage was 50.4% this season. They had a faceoff win percentage of 50.3% as they compiled 2,621 face off wins this season and they suffered 2,586 face off losses. On defense Montreal blocked 1,144 shot attempts and they had 1,933 hits as a unit.